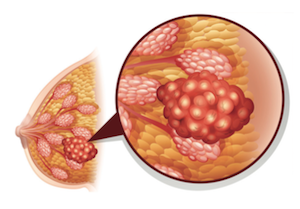 Upfront treatment with atezolizumab (Tecentriq) plus nab-paclitaxel (Abraxane) significantly reduced the risk of disease progression or death compared with nab-paclitaxel alone in patients with metastatic or unresectable locally advanced triple-negative breast cancer (TNBC), according to topline results from the phase III IMpassion130 study. Genentech (Roche), the manufacturer of the PD-L1 inhibitor, also noted in a press release that, “Overall survival (OS) is encouraging in the PD-L1–positive population at this interim analysis, and follow-up will continue until the next planned analysis.” The company also reported that no new safety signals emerged with the combination and adverse events (AEs) were consistent with previous single-agent use of the drugs. “IMpassion130 is the first positive phase III immunotherapy study in triple-negative breast cancer, an aggressive disease with limited treatment options,” Sandra Horning, MD, chief medical officer and head of Global Product Development, Genentech, said in a statement. “Highly encouraged by these results, we plan to submit to authorities globally with the aim of bringing this combination to people with triple-negative breast cancer as soon as possible,” added Horning. The phase III IMpassion130 study enrolled 902 patients with locally advanced or metastatic TNBC who had not receiving systemic treatment in the metastatic breast cancer setting. Patients were evenly randomized between the 2 treatment arms. All patients received 100 mg/m2 of IV nab-paclitaxel on days 1, 8, and 15 of each 28-day cycle, for a target of 6 cycles, with no maximum. Depending on their randomization, patients also received either a fixed dose of 840 mg of IV atezolizumab on days 1 and 15 of each cycle, or placebo. Treatment on both arms was administered until disease progression or unacceptable toxicity. Progression-free survival and OS were the coprimary endpoints. These endpoints were evaluated in both the intention-to-treat population and in patients with PD-L1–positive tumors. Secondary outcome measures included objective response rate (ORR) and duration of response. For the full article, visit OncLive.com.